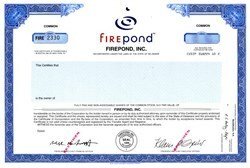 Beautifully engraved certificate stamped speimen from Firepond, Inc. printed in 1999. This historic document was printed by the Security-Columbian Banknote Company and has an ornate border around it with a vignette of the company's logo. This item has the printed signatures of the Company’s President and Chief Executive Officer, and Treasurer and Chief Financial Officer, and is over 12 years old. FPX provides enterprise software that is used to manage customer interactions across a variety of sales channels. Its products include applications for sales force automation, customer profiling, order configuration, and needs analysis, and can be implemented across direct, indirect, and Web-based sales channels. The company focuses on providing tools that aid clients with complex product lines in converting leads into accurate orders. FPX also offers professional services, such as consulting, training, and support. 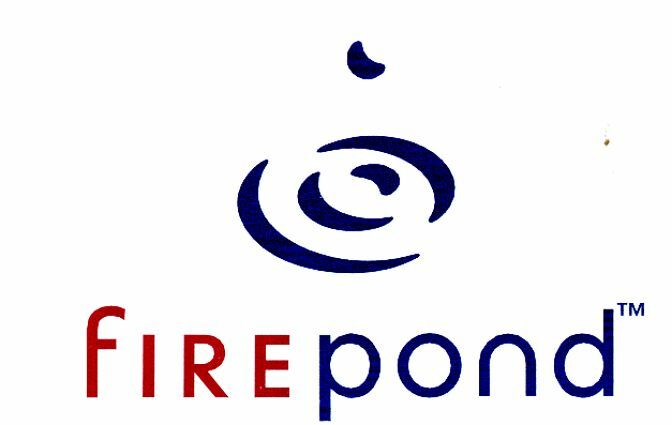 Formerly called Firepond, the company changed its name in 2009 when FPX, an affiliate of Texas-based Acclaim Financial Group, purchased Firepond's assets.